It’s during sharp sell-offs and market corrections that I keep a watchful eye for those cryptocurrencies that begin to show strength and leadership on the way up. As Bitcoin and Ethereum are bouncing, we saw some big movers early on. The one that has my attention right now is Antshares. Antshares will soon be rebranded and will go by NEO. It currently trades as ANS on Bittrex. 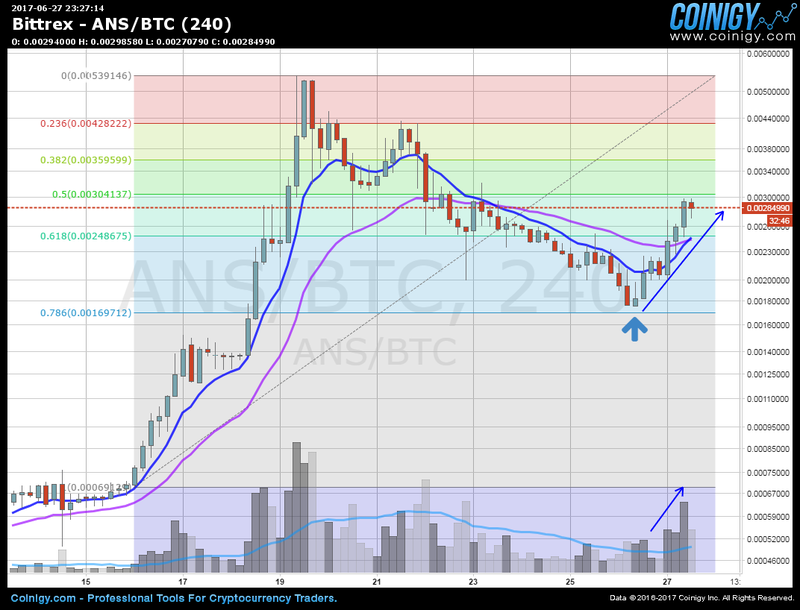 Now, Antshares was already zooming higher prior to the sell-off and also had a decent pullback. However, it’s rebounding with strength and poised to move higher here. NEO is being called the “Ethereum of China” and is a platform that will allow users to create smart contracts and other blockchain services using a wide variety of programming languages. So far, the problems they are solving and the technology behind this project are very impressive and I highly recommend you do more research into them. From a technical analysis perspective, the chart below shows the recent price action. Looking at the Fibonacci levels, you can see that after the big run up, ANS began a correction that bottomed just above the 78.6% retracement level. Since bouncing, the volume has begun to increase which is exactly what you want to see and we are now seeing the moving averages turn north again. 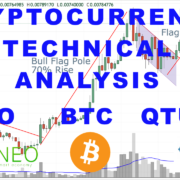 Looking at the daily chart, the move is much more pronounced and today’s price action was very bullish and indicates a lot of interest and accumulation at these levels. Additionally, the volume during the recent pullback was decreasing and prices never fell below the 30-day EMA. It’s now back above the 10-day EMA on the BTC chart. 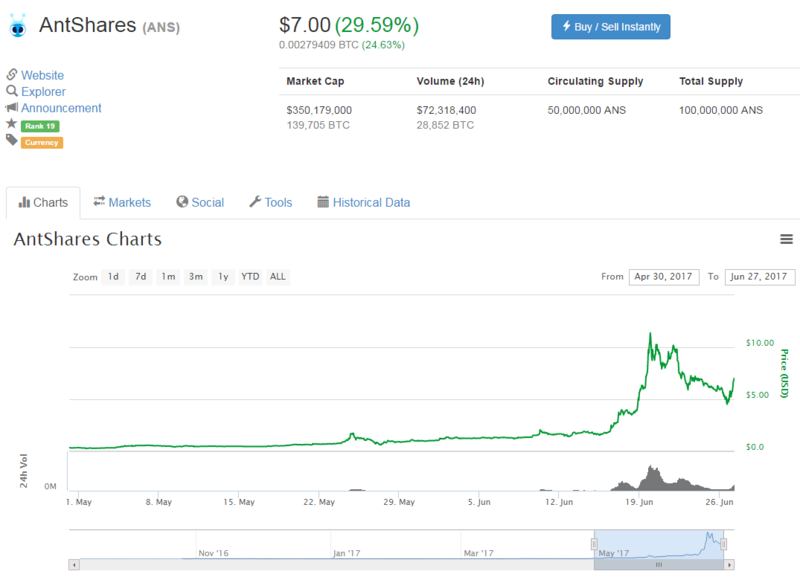 From a price and market cap perspective, ANS (NEO) are currently ranked at #19 on CoinMarketCap and valued at $350 Million. If this truly is the “Ethereum of China”, then we have much more room to grow from a market cap perspective. Consider that Ethereum went from $800 Million at the start of this year to over $36 Billion before pulling back recently. 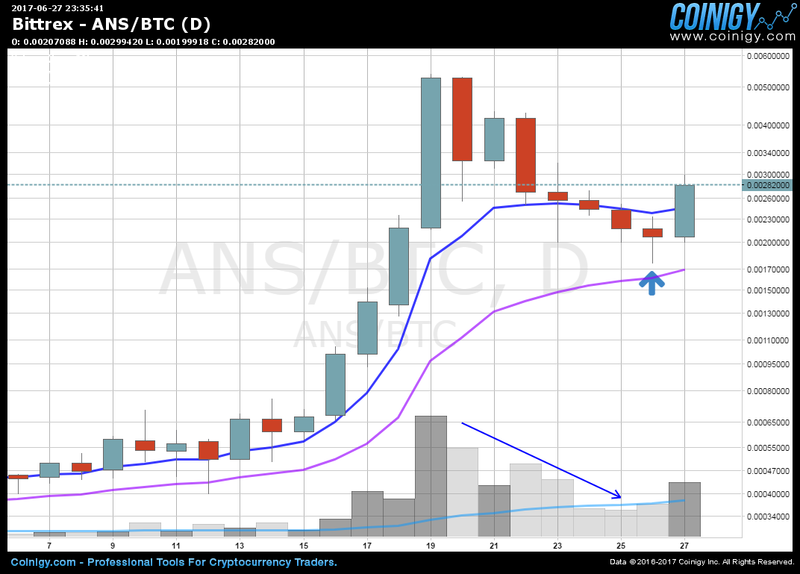 ANS is currently priced at $7.00 but was as high as $11 just a few weeks ago. ANS (soon to be NEO) should be on your watch-list. Did Ethereum just confirm a longer term down trend? Was That the Bottom?